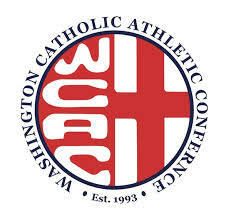 Two of the top four teams in the WCAC square off in a 2 versus 4 matchup. St. John's College (12-1) are eyeing the number one spot in an anticipated rematch with Paul VI (13-1), while Bishop O'Connell (11-5) seeks to gain ground on Bishop McNamara (10-4) a team that they've beaten previously. This game is important as the playoffs draw nearer. In an ironic twist the latter teams play each other tonight as well. The game started off with SJC getting back to back baskets by freshman and NSP Player of the Month Azzi Fudd. O'Connell responded with a bucket by senior Shawn Mills but the trading of baskets if the first quarter was 2 to 1 as the Cadets led 24-12 after the first period. Fudd led the Cadets with 14 of the 24 points while the Knights were led by senior Bre Prepignan with 6 points. The second quarter was scoreless for the first couple of minutes before Prepignan scored on a layup. Fudd headed to the bench for a breather and sophomore Maikia Simmons hit a three and the Knights were in business. Unfortunately SJC had other players read to go sophomore Carley Rivera being one knocked down a couple of 3-pointers junior Alex Cowen knocked down a 3 of her own. junior Anna Hovis scored 3 in the half and did some tough work on the boards for the Knights before Fudd return to knock down a couple of 3's just before the half giving St. John's a 45-22 lead at the break. The opened the second half with a 14-0 run. Fudd, Rivera, senior Sydney Wood and sophomore Malu Tshitenge-Mutumbo all contributed in the run. Around midway in the period both teams went heavily to their benches and SJC to a 67-30 lead into the fourth quarter. The final period was an opportunity to get younger players some game experience and starters some rest. Although O'Connell showed some flashes the night belonged to St. John's winning 80-42. There was a brief pregame celebration as Jakia Brown-Turner was honored before the game for collecting her 1000th as well as being the recipient of the Next Sports Phenom Player of the Month Award for December 2017. 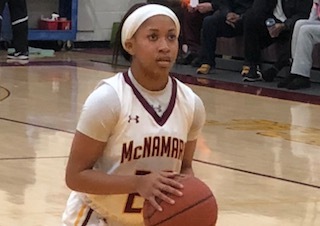 From the beginning WCAC league play game had blowout written all over it as McNamara exploded to a 21-1 lead before a 3-pointer by Carroll's junior guard Rita James which was immediately answered seconds later with a 3 by senior Aliyah Matharu. The Mustangs led 28-4 after 1 with Matharu 1eading all scorers 13 points with and Brown-Turner adding 5 points. As a side note I know from experience that these are some of the hardest games to coach as Head Coach Frank Oliver had to find a balance between keeping his team motivated to play hard without running up the score. One thing that was evident about this team was they aren't concerned much about individual scoring as several players traded easy baskets for an assist to an open teammate. BMac led 52-5 at the half, with Matharu accounting for 15 of the points and sophmore 14 Liatu King contributing 14. The Lions were led by James who had 4 of their 5 points in the half. There was little change to the game in the third quarter as Brown-Turner and King both scored within 15 seconds of the start of the half. The Mustangs was despite playing their reserves for the majority of the quarter outscored the Lions 24-4 and led by 67 points to start the final period. The fourth quarter brought a little excitement as the crowd wanted to see 100 points on the scoreboard and the Lions fought back toe to toe like a championship fight losing the period by only 3 points 23-20. In the end Bishop McNamara was just too strong winning the game 99-29. Coming into the game Crossland had a lot of things in their favor, they had been battle tested in two major tournaments playing in both the She Got Game Classic and the Title IX Holiday Showcase, they had two players averaging over 15 points per game in Katelyn Canlas (17.3 ppg) and Alexus King (15.9 ppg), also two of Largo's starters where out with injuries. The Cavaliers started the game hot, breaking out to an early 6-0 lead and led the home team Largo Lions 14-9 after the first period. Crossland seemed to be in control during the quarter, but both teams had concerns as the team fouls began to mount up with 20 team fouls (10 each) in the first quarter and each team being in the double bonus well before the quarter ended. Despite having the lead, Crossland would have the worst of the situation as they came into the game with only 7 players on their roster and they were having difficulty containing the area's leading scorer Stephanie Guihon who had 8 of her teams 9 points after the first period. Crossland was still able to stay on top leading by as much as 9 points before heading into the half with a 26-21 lead. 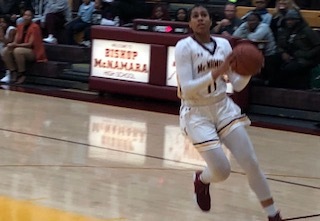 Guihon, who had been averaging over 30 points per game, had scored 16 points of the Lions 21 by halftime while Canlas and King combined for 14 points between the two. The Lions made some adjustments at the half and were able to get their first lead of the game with 3:30 remaining in the third after a steal and break-away layup by Briana Jones (10 pts), and Largo was up 37-34 heading into the 4th quarter. The final period went back and fourth with 8 lead changes in the period. King led the way for the Cavs with 21 points and Canlas added 17 points as they had to finish the game with four players due to foul disqualifications. The Lions were also plagued with fouls but had enough depth to finish off Crossland in what turned out to be a pretty exciting contest. Largo's Stephanie Guihon who was named Next Sports Phenom's Player of the Month for December finished with a game high 27 points and 10 boards while going 15 for 18 from the line. Jocelyn Manning added 14 boards to go along with her 8 points and Assata Reid added 10 points in the win. 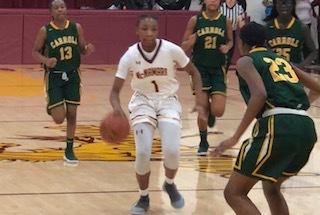 In an evening that started with celebration with Mia Davis being awarded the Next Sports Phenom Player of the Month Award for the month of December, St. Frances still had business to take care of in the form of conference foe Seton Keough. The Panthers led 18-13 after 1. 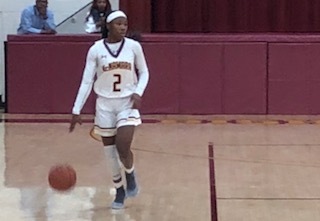 Tyanna Custis (Massachusets) led with 6 of her 12 points in the period while the Gators were led by Brittani Smith who tallied 8 points and was the only player from Seton Keough to notch double figures for the game with 12 points. The game broke open for St. Frances in the second period as they turned on the defensive pressure holding Seton Keough to only three points in the quarter as Mia Davis scored 7 of her game high 15 points in the the period and went into the break with a commanding 34-16 lead. The second half didn't get much better for the Gators who were again outscored by double digits. 18-8. Tyeisha Smith (Seton Hall) led the way in the third with 6 of her 10 points while Davis and Custis combined for 30 rebounds as the Panthers sat theirs starters for most of the fourth quarter and cruised to a 67-38 victory.